Old Bollywood poster for sale of the classic Hindi film Sanyasi (1975). 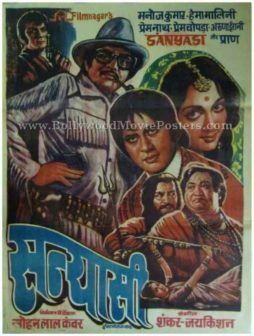 This is an actual surviving old Bollywood poster for sale of the 1975 Hindi film that starred Manoj “Bharat” Kumar opposite Dream Girl Hema Malini. Printed and circulated a few years after the original first release run of the film (somewhere in the late 1970s), this old Bollywood poster for sale was designed for publicity of the film but never ended up being used. This vintage Bollywood poster for sale was originally hand painted on canvas by a small time poster art studio in Delhi, giving it a very quirky appearance. Hand drawn quirky portraits of key members of the star cast such as Manoj Kumar, Hema Malini, Prem Nath, Prem Chopra and Pran are seen in this old Bollywood poster for sale. Very rare, original vintage Bollywood poster of the Madhubala film, Badal (1951) for sale. This is an actual surviving old Bollywood poster of the 1951 Hindi film which featured the most beautiful actress of all time in Indian cinema, Madhubala in the lead role opposite actor Prem Nath. This old Madhubala poster was printed and circulated during the first release of the film in the early 1950s. Originally designed for publicity of the film, this old hand painted Bollywood poster never ended up being used. Originally hand painted by one of the finest Bollywood poster artists in history, B. Vishwanath, the poster bears his printed signature on the bottom right hand corner. Artist B. Vishwanath’s flair for watercolor painting is evident in the style of artwork used in the background. The lead actors are seen in a romantic pose in the center, with a war scene unfolding at the bottom. This beautiful vintage Bollywood poster has been graded as ★ As Is due to significant water stains visible on the poster. Please study the accompanying image of the poster carefully before placing an order. 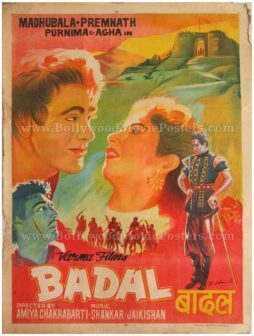 Badal is a 1951 memorable Bollywood film starring the most beautiful actress in Indian cinema, Madhubala in the lead role opposite Prem Nath.